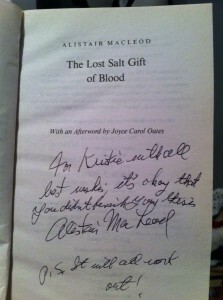 Rest in Peace: Alistair MacLeod. Thank you for the stories. Sometime less than 10 years ago and more than 5, I sat in a room full of other bookish Word Nerds, listening to the last lecture on a great Modern Canadian Literature novel. The lecture was given by one of the best teachers I’ve ever had. It was about an especially poignant story, explained with Jenn’s especially fantastic passion, and as she wrapped up the story perfectly, we looked around at each other and realized all at once that we were all crying. Well…except for Chris; he was feeling mostly awkward about all of it. At any rate, the book and the lecture were phenomenal – in equal measure – and we simply lapped it up: the peace of remembrance; the pain of redemption, found too late; the clarity of fresh water and a hella web of perfect metaphor. It was all perfect. Afterwards, a few of us traipsed to a local coffee shop – a bar now – and chipped away at coffees, sandwiches, papers and other writing assignments. I stepped away to hide and smoke outside (because I still smoked then, but felt compelled to engage in the great big pretend-you-don’t-smoke thing), and sat on a concrete cube with a pad of paper, a pen, and a half-smoked Peter Jackson cigarette. I watched a line of water trickle between two bricks, and wrote a poem. It was for an assignment in that class – a reaction to the book, No Great Mischief by Alistair Macleod, and it poured out like the water always preeminent in his stories. Alistair – with whom I choose to pretend a first-name type of relationship, much like I once pretended that nobody knew I smoked – became the background music under which I learned about all of the words and stories of the place I call home. His solid voice of here and there and in between became the voice to which the others all harmonized. Laurence sang a brazen alto to his tenor, while New Brunswick’s own David Adams Richards groaned a sad and angry baritone beneath. Margaret Atwood’s second soprano? It’s not ever in the melody you expect, but she somehow knows the tune before any of us can even tell what song it is, and nails it. Avison, and her horizons, her endless meanings inside of meanings play a descant over and above, and our now Nobel-Laureate Alice Munro gives lyrics to all of their lyrics, while Frances Itani weaves Bailey’s Hands into the song. It is a beautiful song, and Alistair MacLeod introduced it to me, with a short glass of salt water, on the rocks. Alistair – it should be said – destroyed my honours thesis. His story and his voice kept finding purchase inside the theories I tried to weave around Margaret Laurence and her storytellers. His voice kept singing louder than hers in my mind, and I made the mistake of trying to shush him instead of asking Margaret to sit this one song out. I tried to wrestle against the story I needed to tell, in order to write the story I wanted to. In the end, I gave up on the whole fighting match. I choose to blame him. Chera and I met him last year, at the local literary festival – Frye Fest – where the high five heard round the world occurred (another story for another day), and Chera asked MacLeod to absolve me for my thesis stage fright. He took that blame with confusion, true, but with grace as well: the grace of Grandmother Connor, some might say. For Kristie with all best wishes. It’s okay that you didn’t finish your thesis. PS – It will all work out! Rest in Peace, Alistair, and thanks again for giving me a pass on the whole thesis thing. Thanks too for the stories. We are all better when we are loved – you were right, and you have been loved by many of us who’ve never met you, the man – but rather have grown to know and need and love the storyteller you were. as frothing eyes peering from fathoms and fathoms. Coalescing in a rainbow spray of story. Each trail down a mountainside, or cheek. Leaving only the strongest rocks and burnt, hard mud-caked beds. Or cold, hard, life-stained eyes. These tears. these beads, of many crying. Always in flux, and yet returning down. Down to the beds below what the eye perceives. There is a place where tear drops meet to become the ocean flow. Salt and bracken, filthy barm. washed in the washing, and lost in the telling. Wet and soft, the yielding force. The strength of water: the earth’s remorse. It bubbles out where the binding skin of earth is broken; delivering what it is to be loved: It is better. We are better. We are better when the flow breaks over us, when we dip our hands, our sodden hands Into this – our past. Each wave forgets that it is not alone. Each drop or puddle assumes its having been forgotten. A tumult, breaking of rock brings home the lost. In this our story, our past, our hope. Our well. Kris is a writer, editor, illustrator, teacher, mother of two amazing young ladies - and enthusiastic cat-belly snuggler. 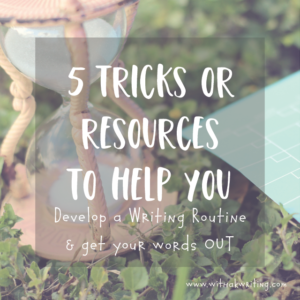 A certified teacher, long-time blogger and experienced brand consultant, she writes about Writing, Business and Blogging...and sometimes about Changing the World. 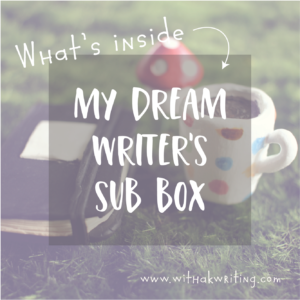 If I had a Writers’ Sub Box for #30DaysWithaK today, what would I put in it? 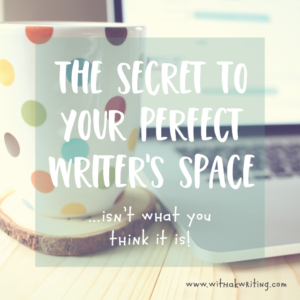 Your Writing Space Doesn’t Need Another Plant. 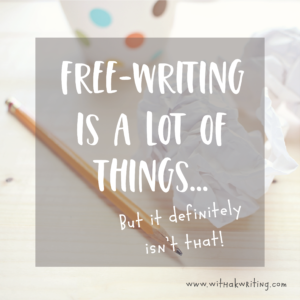 Free-writing isn’t what you think it is…at least not completely. 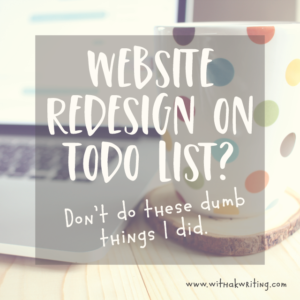 Don’t Screw up Your Website Redesign – Like I almost did. 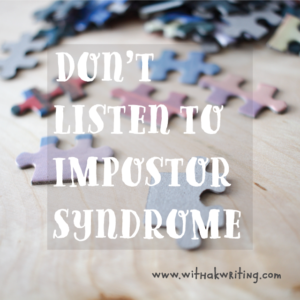 Don’t listen to Impostor Syndrome; You aren’t JUST anything.